A selection of Beam's premium brands. 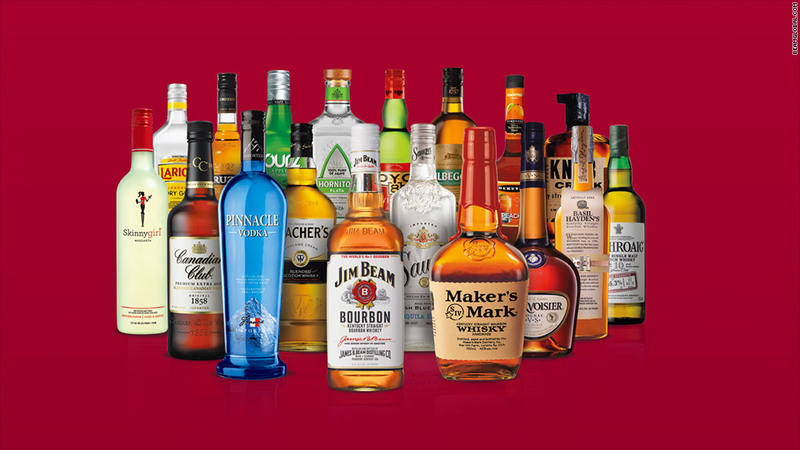 Suntory Holdings, a massive Japanese beverage company, is acquiring American spirits maker Beam for $16 billion, creating one of the largest premium spirits companies in the world. The all-cash deal values Beam at $83.50 per share, a 25% premium over Friday's closing price. Shares in Beam shot up in premarket trading Monday after the deal was announced. Beam is known for its brand-name products, including Jim Beam bourbon, Maker's Mark whiskey and Courvoisier cognac. The transaction is expected to close in the second quarter of the year, provided it receives all necessary shareholder and regulatory approvals. Beam's CEO Matt Shattock said he was excited about the deal, noting that the combination of Suntory and Beam would create the third largest global spirits maker. "The combined company will have unparalleled expertise and portfolio breadth in premium whiskey, which is driving the fastest growth in Western spirits," he said. Suntory is a well-known name is Japanese households. American movie fans might be more familiar with actor Bill Murray's endorsement of Suntory products in the 2003 film "Lost in Translation." In July, Suntory Beverage & Food raised $4 billion through an initial public offering in Japan. The company, a division of Suntory Holdings, distributes Pepsi (PEP) in Japan, along with Orangina.